CLASSIC TRACKS. A Retro Harley Street Tracker from Clockwork Motorcycles. I recently pulled my old turntable out of the garage and got it up and running again. A new needle and belt, some dust removal and a few solders here and there and suddenly I’m rediscovering a wall of vinyl that hasn’t been played in many, many years. It’s easy to forget just how much great music was recorded in the 70s and 80s. You could dismiss the era as wall-to-wall makeup and silly hair, but a closer inspection will reveal some amazingly inspired, and beautifully timeless work. 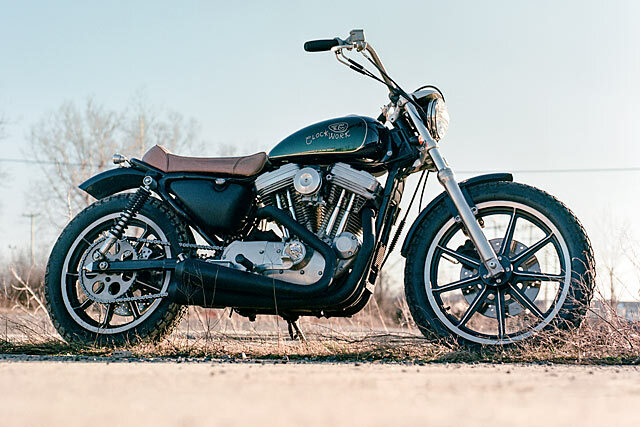 Sam from Canada’s Clockwork Motorcycles has taken a similar approach with his latest build – a retro Harley Sportster with all the right influences. All or nothing. It’s a phrase you’d probably take to mean ‘no middle ground’. 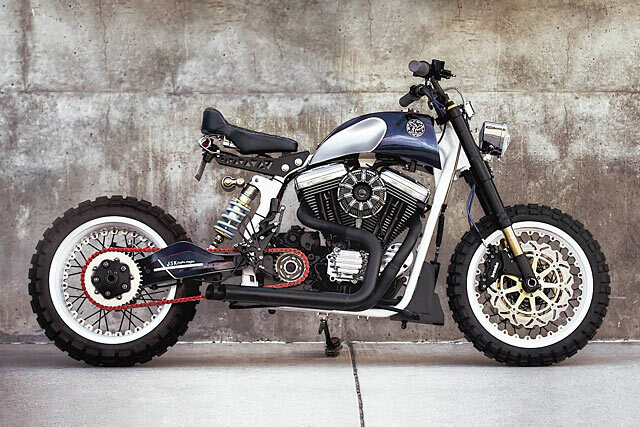 But it seems more and more builders are using it as a yard stick to define new genres for custom bikes. All of the popular styles rolled into one, or maybe none of them at all. What would a cafe scrambler tracker look like? Or an enduro street fighter? Conversely, how would a bike built purely to suit personal needs rather than a pre-existing category or style look? 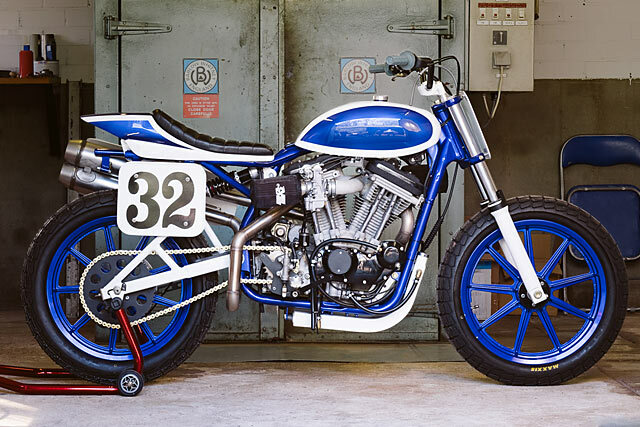 It seems that the cafe racer’s rule might just be coming to an end, and builders like California’s Sam Kao and his ‘Cobalt Storm’ Harley look to be on the crest of something very new. 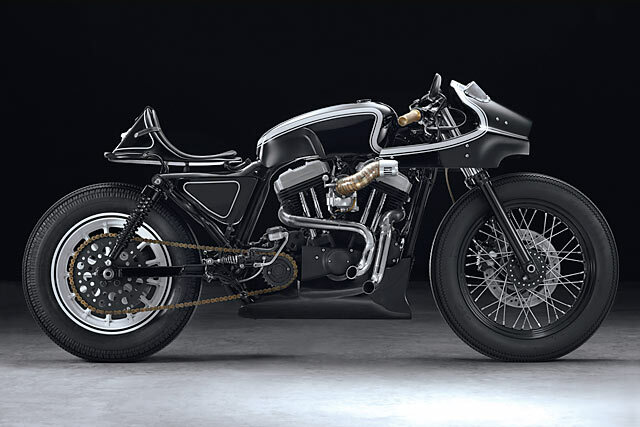 Back in 2013, Harley-Davidson announced the addition of two all-new models to their range, the Street 500 and 750. The development of these motorcycles signified the end of a 13-year-long new model drought for the Milwaukee giant and added a new category to their offering, namely, small capacity motorcycles. The development of the Street came with two major benefits. 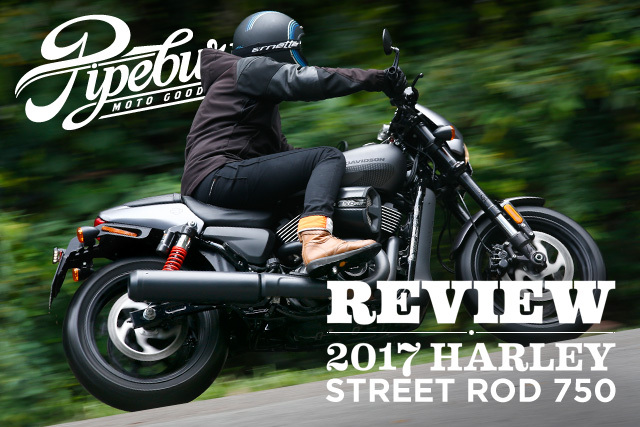 Firstly, Harley finally had a motorcycle in their range for new riders and secondly, it was a machine more suited to the emerging markets. It’s fair to say that we’re all very used to the notion of one bike, one builder. While shops may work with an upholsterer or painter to help their project look it’s best, we very rarely see multiple builders working together on the same bike. Well, now its time to try something a little different. Namely, a three-builder collaboration. Sure, it could end up a dog’s breakfast. But what if instead it took the best skills of all three players and ended up with something superlative? 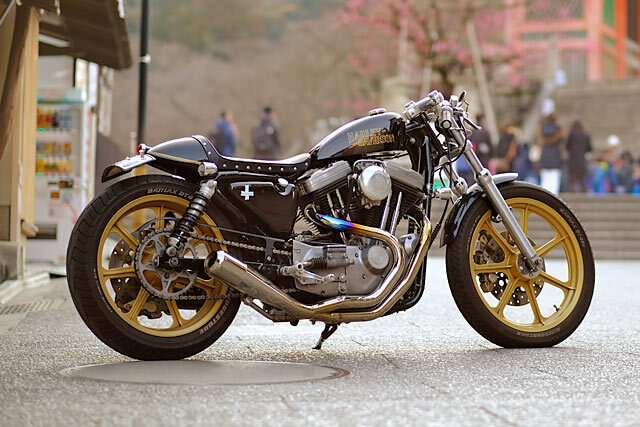 Here’s a clearly superlative HD 883XL from Kyoto’s Hirock, by way of Nice Motorcycles and Plus Cycles, too. 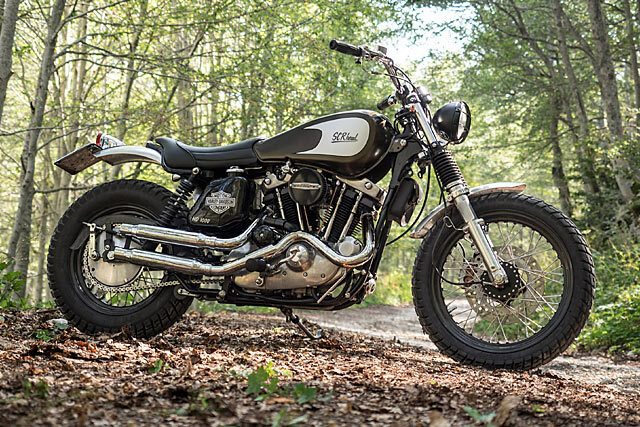 Harley’s original XR750s are the stuff of legend. With a winning streak that started in 1972 and is still being felt in flat tracking today, many argue that it’s the world’s most winningest motorcycle. Which is a pretty amazing claim to fame, when you think about it. The Netherland’s Bart Verstijnen knew he could build his own XR750 if he really put his mind to it. And once you see the twin Mikuni’s, you know this isn’t just a tepid homage. Oh no. This is the real deal. It can take years. Each second feels like an eternity. From the moment you spot ‘the one’ crossing the road in front of you until the day you finally get up close and personal. But when we spotted this sporty shorty in the workshop corner of Malaysia’s Beautiful Machines, we knew we had to have her. That was when they were preparing their incredible ‘Monster’ for the Yokohama MoonEyes Hot Rod & Custom Show. But we couldn’t just show her off to you in any old state, so we took one for the team and waited until we could get just the right shots. Now for her big debut we can finally present ‘Puting Beliung’; it means ‘Tornado’ and she’s a Harley Davidson Sportster XL1200N Nightster that’ll literally sweep you off your feet. When you’re young, brash and at the top of your game you can push a lot of buttons and get away with it. Just ask the great Muhammad Ali who once said, “I done wrestled with an alligator, I done tussled with a whale; handcuffed lightning, thrown thunder in jail!” The motorcycle equivalent to this level of smack talk is like standing in front of a pack of grey bearded Harley Davidson enthusiasts having defiled the purity of some fine Milwaukee Muscle. The reaction will come quick; bottles may fly, F-bombs will rain down and a chase worthy of the Blues Brothers will ensue. 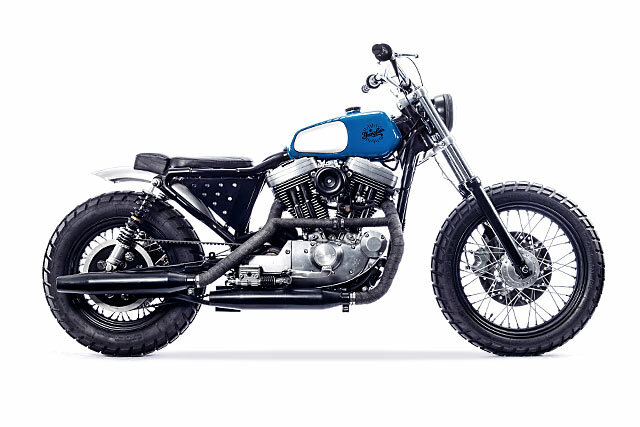 It’s not that the Young Guns Speed Shop lads set out to upset those who cry, “why?” – it’s that they simply answer, “why not!” Their latest bike is yet another badass build with an exclamation point, a 1999 Husky Harley Sportster known simply as ‘DK’. Among all species of creation there are occasionally specimens who are malformed in whole or in part; the most grossly abnormal of these have been referred to from ancient times as monsters. The name connotes something almost evil, physically intimidating, possessing unseen levels of power and generally considered freaks of nature. 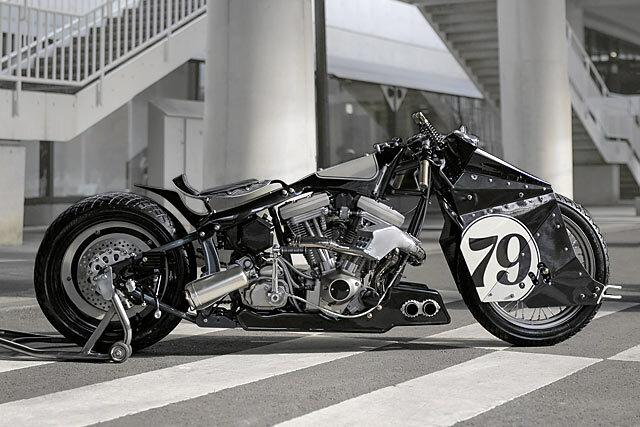 And as soon as you glimpse the first image of Beautiful Machines insane 1991 Harley Davidson Heritage Softail you know the name Monster fits. It’s been five years in the making at their workshop in Sunway, Malaysia, where it has been a passion project for head honcho Rajay Singh. The final incarnation rolled out of the Beautiful Machines laboratory just in time to make a splash at the recent Yokohama MoonEyes Hot Rod & Custom Show.